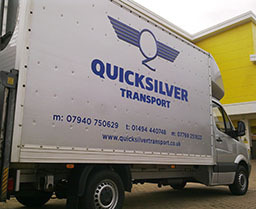 Welcome to Quicksilver Transport, wholly owned and managed by Michael Garden. My services include removals, deliveries and relocations, but I am also licenced to carry waste should you require my clearance service. I firmly believe in providing the highest quality service on every occasion and take great pride in the work done. I am based in High Wycombe but am not at all limited to this area, with work taking me throughout the UK and occasionally across to Europe. Mainly operating a Mercedes Sprinter Luton box van with a tail-lift, we specialise in providing flexible solutions to residential and business removals. Transportation of high-value items such as pianos, artwork and antique furniture is something I have done successfully for many years now. I am regularly recommended by two Big Yellow Self-Storage Company sites; High Wycombe and Oxford. I am also fortunate enough to be able to assist Fitzgeralds Interiors, Emma and Eve Interior Design Ltd, Berkeley Homes and Hill Residential, with their respective deliveries and show-home installations. Other regular clients include Nuffield Health Gym sites in London and Tinies Childcare. My rates are very competitive and flexible as I recognise that every client has their own requirements, and I take pride in offering an individually tailored service. In addition to the office telephone number 01494 440748 you can contact me on 07940 750629. I look forward to hearing from you to discuss your requirements, and to providing you with a truly first class service. In addition to the testimonials below, you can find Reviews on Freeindex, Which? Local and Marlow Parents websites.